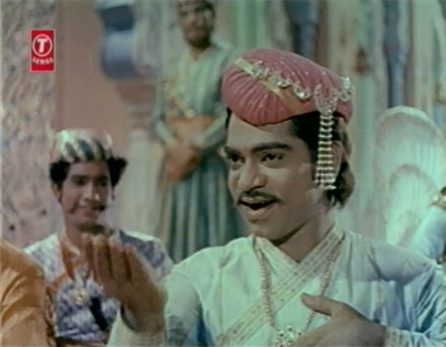 Like most westerners discovering Hindi films and music, I fell in love quickly with the wonderful song form known as “qawwali.” People have many different interpretations on what a true qawwali is; I am just going to list my favorite film qawwalis, which I know have taken some liberties with the pure form. I like this particular article about qawwali and its history and development. My personal criteria are that there be at least one singer with a chorus, and the song should build in rhythm, accompanied by clapping in addition to musical instruments and picturized in front of an audience which joins in. I also prefer the ones from older films which use more traditional instruments (e.g. dhola, harmonium, tabla, sarangi), and which usually begin with an alaap. If a “nautch-girl” is dancing, I consider that a mujra, not a qawwali. My definition and preferences might be too narrow for some, and too broad for some, but hey—it’s my blog! I am keeping the list here to ones in films I’ve seen and which I remember vividly for their place in each film. So here they are, my favorites, in no particular order (because limiting them was hard enough without having to prioritize them). I **finally** understood Rishi Kapoor’s appeal as I watched him perform this song. 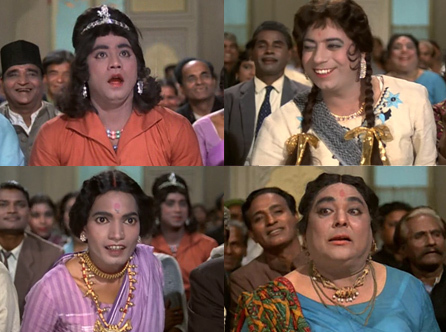 The audience’s joy juxtaposed with poor hunted Nirupa Roy trying to hide from Ranjeet and Jeevan is just brilliant! 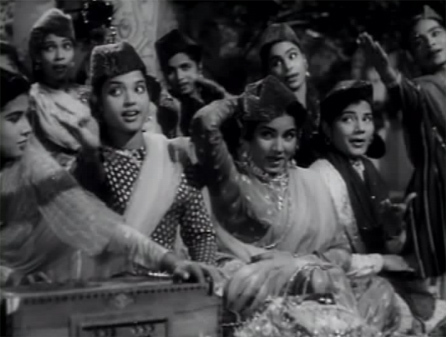 Sanju Baba’s first film appearance (below left), and a rollicking accompaniment to Waheeda Rehman peeping at Sunil Dutt as their romance begins. Plus, I love the hats. Their fondness for her is apparent, as is their inability to see her as a human being. Her suffering seen against their light-hearted fun is very poignant. A performance to celebrate the birth of a baby boy whose real mother has had to give him up for adoption; once again sorrow (hers) is contrasted against the festive air of the qawwali. All the music from this film is great. If I absolutely had to pick one soundtrack to take with me to a deserted island, this would probably be it. You all know the story! I’m pretty sure everyone knows all about this one too, so I need say no more! 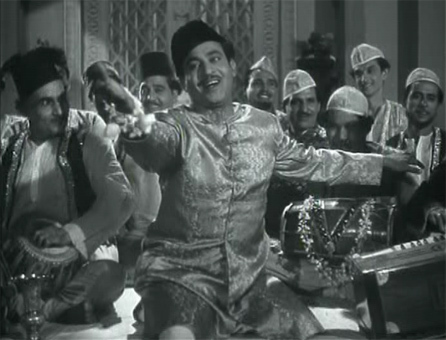 I just can’t keep Shammi out of this as he hams it up as a woman (along with Mohan Choti behind him). How such a beautiful man can be such a hideous woman is beyond me! A gaudily dressed troupe of musicians keeps passengers entertained as their doomed train hurtles towards its destruction. A great film with a great cast. A thief escapes capture by singing this qawwali as his accomplices, all in drag, pick the audience’s pockets clean. Hilarious! Other qawwalis that I particularly like but haven’t seen in movie context are “Jhoom Barabar Jhoom Sharaabi” from 5 Rifles (1973); all the ones from Barsaat Ki Raat (which I really really need to see); “Daag Na Lag Jaye” from Mera Naam Joker (which I just can’t bring myself to watch); and “Hamen To Loot Liya” from Bijlee (1972). What are your favorite film qawwalis? Posted on July 12, 2008 at 2:56 pm in Hindi movies, Memsaab's lists, Yahoo! Shammi! | RSS feed You can skip to the end and leave a reply. Mujra or no mujra, qawwali is just a genre of music (usually Islamic) – as you would know, it has a distinct style. I suppose to non-South Asian filmi fans, the characters would have to be wearing specific clothing and have a certain body language to easily recognise it as a qawwali. this is just no right. Music is not allowed in Islam. Please don’t spread wrong information if you know anything about it !! Hum Kisise Kum Nahin title song is my favorite in this list. I love filmi qawwalis, too! They may be a corruption of *real* ones but I like the filmi-ness better. Especially the delicious gender-war that is usually the theme of the filmi ones. Love the qawwalis from Barsat Ki Raat (1960) especially Na to caravan ki talaash, the ones from Chaudvin Ka Chand, and was dangerously hooked to Humen to loot liya! Oh.My.God. The two of you have just informed me about this Shammi film that I did not know about. It would have definitely made the list had I seen the film! Is it available on DVD? I somehow doubt it, because if it were, I would have it. But I cannot die now until I see it. Fabulous!!!!! I’m speechless (well, clearly not really) with the joy of it. I bought the VCD from Rhythm House but was terribly disappointed with the result! Oh, good, then I CAN die now. Whew. I need to buy a VCD player. There is too much good stuff out there that’s not on DVD yet. But maybe I can skip this if the brothers S.Kapoor are only in the song. Great list, Memsaab! I really like your list, although I have not seen most films. Have seen the films with #s 1, 6 and 7, and love them all (Teri mehfil mein qismat aazmaa kar being my favorite). 2) Khwaaja Mere Khwaaja (from Jodhaa Akbar), in which that last bit with Hrithik was fantastic. As the emperor, he had the face of one palm pointing toward the sky, the other to earth, as if to request divine intervention in getting blessings from the heavens to the earth and his people. Even more relevant because the part of the method of prayer in Islam (and other religions too) employs the palms. My favourite is Na toh karvaan ki talaash hai (and its extension, Yeh ishq ishq hai). Amazing qawwali, by far the best I’ve ever heard! Do try and get hold of the movie – it’s great, and the music is superb. I love coming to your blog, memsaab, because doing so reminds me of how much I’ve got to learn about Bollywood. :-) I haven’t seen one of the qawwalis you’ve listed! So far my favorite is the one in Veer-Zaara, which is a movie I know you can’t stand. Ahh, the qawwali! I actually knew about qawwalis before getting into Hindi films (through Nusrat Fateh Ali Khan, by way of Jeff Buckley and a love of Sufism), so I was thrilled – thrilled! – to see them everywhere in films. Hmm, all the ones I can think of, off the top of my head, are either mujras or not filmi. But sharing is caring! 1. 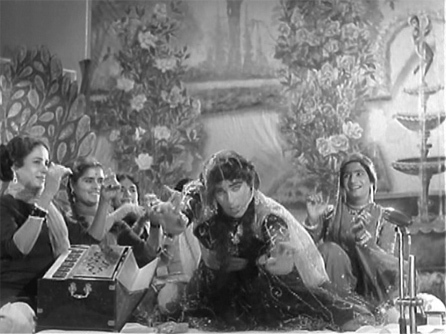 Maar Daala from Devdas. The film with gender relations from hell and naach-gaana from heaven, this one makes me get verklempt. So beautiful and sad, sigh. 2. Tumse Milke Dil Ka Jo Haal from Main Hoon Na. More SRK! Probably mujra, by your definition, and definitely a crazy parody of a real qawwali, but ahh, it’s lovely. Over the top and zany and hilariously good-humored. I am also shocked – shocked! – to learn that SRK apparently “hated his dance steps for this song”, since this is the song I always use in my head as the prime example of why SRK is a fabulous dancer and performer. 3. Duniya Hai Aati Jaati from Chor Sipahee. Because the internet hates me, this is not available on YouTube. One of my fave qawwalis because it features Shashi (whee! ), Vinod (whee! ), Shabana (whee! ), a sublime musical bridge (whee! ), and sublimely philosophical lyrics (“only lovers live!”). 4. Dam Mast Qalandar by Faiz Ali Faiz. Not from a film at all, but I just love this one so I must share. 5. Yeh Jo Halka Halka Saroor Hai by Jeff Buckley. Again, not a film, but this is an amazing cover which must also be shared. Jeff Buckley, American singer-songwriter, covers Nusrat Fateh Ali Khan’s Yeh Jo Halka Halka using only his amazing voice, an electric guitar, and Urdu lyrics learned phonetically. This is on the Live at Sin-e album, which is just Jeff and his guitar. Wow, thank you all for your contributions, some of which I will need to investigate as I’m not familiar with them. Madhu: I have been looking for the film, but it’s out of stock for some reason at all my usual buying haunts…but it’s good to have something to search for. ppcc: One more reason I NEED to see Chor Sipahee! Thanks for all the suggestions, filmi or otherwise. You are forgetting The quawwali, from a movie based on quawali writers and singers, i.e. Sorry, i missed the bit where you said you had not gone round to watching Barsat ki raat: come on, if you like quawalis, you Have to See this one Soon! The latter are a pair of real-life quawwals, i.e. they earned their living as quawali singers. Barha lutf thha jab kunware thhe hum tum. ooh, just found it on youtube, recent posting.. I think the lyrics in both, despite the deep insults, are very tasteful and never descend into cheap vulgarity. I also love ‘Parda he parda’ from Amar, Akbar, Anthony. And ‘Khwaja mere khwaja’ from Jodha Akbar. 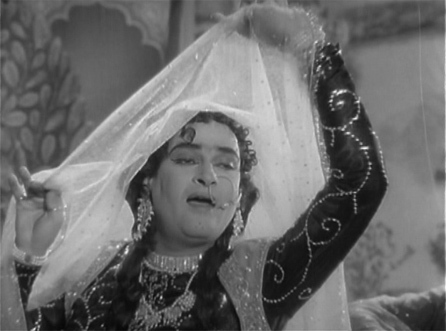 But of course, a lot of the fun of the filmi qawallis is in the costumes, the tussle between male and female, and the ubiquitous drag. Memsaab, by the way don’t get confused if you appear to see what seems like Madhubala?? in this 2nd quawali. This was an actress who appeared in the late 70s/early 80s, acted in some Punjabi films and very low-key Hindi films..forgotten her name. I remember one popular Punjabi song filmed on her “Jad jad o banere bole kaan”. Wasn’t much of an actress and the Madhubala thing (her greatest asset?) didn’t stand a close look. Obviously cultivated the effect: just goes to show how unique Madhubala (or any other personality) is. Thanks for another enjoyable and educational post! Loved it! thanks for the post – I enjoy your site – as always! madhuban mein radhika is actually not a qawwali. Its rather a song based on hindustani music but is one of my personal favorite songs. 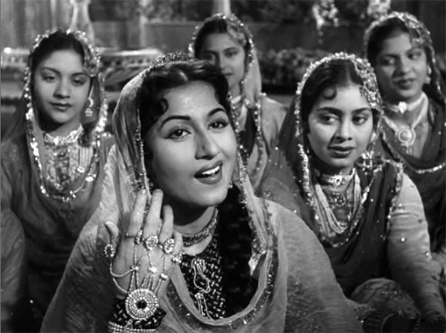 OK, if that doesn’t count, then my favorite qawwali is your #4, “Aaj Kyon Humse Parda [Hai]” Actually, I listened to the Sadhna soundtrack again tonight, and I think I like this song even more than “Madhuban Mein…” anyway. Wonderful post and great comments. 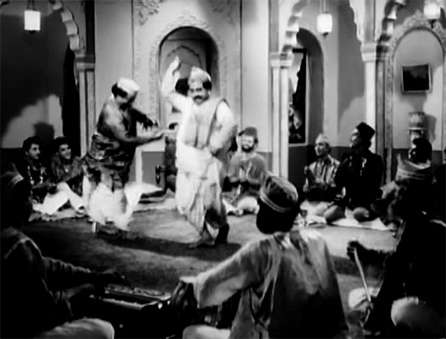 In the old days, the filmi qawwali was more like a musical debate, with one side making a point and the other side countering it (for example in Mughal-e-Azam). Modern filmi qawwalis only have one viewpoint, there’s no counterpoint. Also, Madhuban mein Radhika is a Bhakti song. Bhakti is a similar genre to Sufi, except the imagery is distinctly Hindu (Radha dancing in the forest to Krishna’s flute). Thanks for the insight re: Madhuban Mein Radhika as well. Anonymous, thanks for the clarification about Madhuban Mein Radhika. I was just reading an interesting comment on YouTube about how this is indeed a Hindu song but the performers in the film scene are all Muslim. That’s a nice one, Richard! Especially since young Pran is sitting on the sidelines! I think you have written an excellent article. The comments are excellent as well. Based on this and some googling, I have prepared a list of good Qawwali songs n wanna share with you all..
My favourites are ‘yeh mana meri jaan’ from Hanste Zakhm and also ‘raaz ki baat kehdoon’ from Dharma. 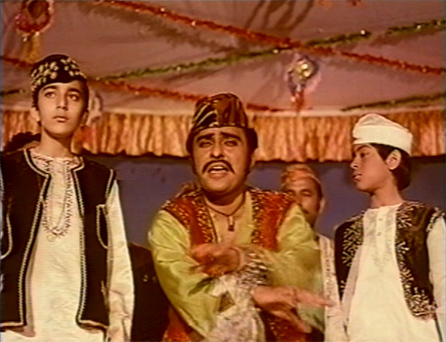 I just watched Mehndi Lagi Mere Haath, and it’s got a qawwali I like quite a bit. It’s basically a debate about love — the other guys are for, and Shashi is against. Hey thanks for this list and comments…It helped me to know new qawwalis. I love qawwalis…I have hardly ever come across a bad one. (maybe somebody can make a list of those too. :-) ). I love “Aaj Kyon Hamse Parda Hai” from Sadhana. Barsaat ki Raat has “na to caravan…” and that ultimate qawwali “ye ishq ishq hai ishq ishq”. To me, “Ye ishq ishq” is the mother of all qawwalis. I can keep listening to it. Roshan shows his magic again in “Dil Hi To Hai” with “nigahen milaane ko jee chahta hai”. If you are interested in funny-but-rather-macabre lyrics, check out Putlibai. “Aise besharm aashiq…”. It is a rollercoaster of insults between the “man” and the “woman” in the qawwali – makes for hilarious listening. “Sharma ke yun sab pardanashi” from Chaudhvin ka chand is great too !!! Shamshad Begum’s voice is so good !!! “Humen to loot liya” is also OK. As is “jaaneman ek nazar dekh le” from Mere Mehboob. (Qawwali) And if you like Mumtaz, there is ‘Allah, yeh ada kaisi hai in haseenon mein”, from ‘Mere Humdum Mere Dost”. Mumtaz is great here. The rest of the cast includes Dharmendra, Sharmila and Om Prakash. Very enjoyable- also gives you a glimpse of how Delhi looked in the 1960s. The following are qawalies I found for 2005 and 2009. There are several songs that have Qawali type beeat, which are not included here. What a fabulous article and collection of qwaalis. I think the main part of qwaalis that I love is the different style of clapping. It gets very artistic at times. I don’t know how to embed the video clips so I can just provide a link to a very typical qwaali where the two parties are at the wedding and praising their side (the bride’s and groom’s) and both declaring how lucky the other is to get the other. Even the clapping is prominent. Thank you once again for this lovely opportunity to wallow in the wonder that is qwaali! See how easy it is to embed video? You don’t even have to know you are doing it! :-D Thanks for sharing! Oh the list would be incomplete without this one from Chaudvin ka Chand. And I was happy to see that the link gets embedded automatically. I’d love to read your review of this film – chaudvin ka chand, memsaab. If you haven’t seen it, please do. Wow, So many great qawwalis are listed in this single post and the subsequent comments. As has been mentioned by someone already, this post is an amazingly informative one. I have certainly gathered lots and lots of new information from this post. Pacifist: I love Chaudhvin Ka Chand…am a big Guru Dutt fan in general :) And Waheeda too! Atul: Yay!!! Will we be seeing some of these qawwalis showing up now on your site with the lyrics? Indeed, I am planning to post the “Tajmahal” qawwali to begin with/ It is such a looong qawwali, neraly 10 minutes long. This must be one of the longest qawwalis ever. I have already posted a few qawwalis in my blog. viz that of “Barsaat ki raat”, “sadhana”,”bluffmaster” and “The burning train”. 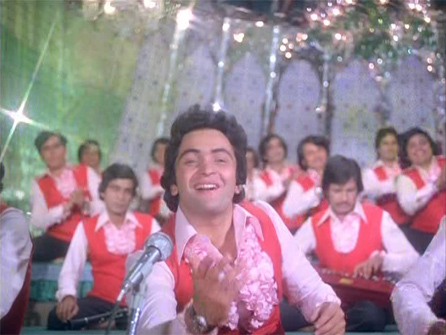 One of my favourite qawwalis that has not been mentioned by anyone is “jeena to hai usi ka jisne ye raaz jaana” from “Adhikaar” (1971) and “Hamen to loot liya milke husn waalon ne” from “Al Hilaal”. Edited to add: But they sound exactly the same to me! “Al Hilal” was a movie of 1950s. So I obviously would like to consider “Al Hilal” as the movie that originally contained this qawwali. “Der na ho jaaye kahin der na ho jaaye” from “Henna” is one song that is a qawwali accompanied by a dance. And the dance is wedding dance, not mujra dance. Five Greatest film qawwalis ever made. Incidently all featuring Rafi. Meemsaab, how can you miss last 2? Sorrrry, for missing one more gem. as the numbering suggests, not merely my favourite qawwali but my favourite filmi song ever and one of my favourtite pieces of music fullstop. One of the few, along with Beethoven’s 9th, that I can listen to back-toback two or three times in a row without tiring of it. I sadly have not been able to find Barsaat Kit Raat but I’m still looking! LOL@one song being your numbers 1-10—that seems like something I would do! Barsaat ki raat was in the latest lot I ordered and received from Induna. It is an ‘Eagle’s’ DVd. This film has not one, not two, but three quwaalis!!! And there is that scene where Bharat Bhushan (the poet) sees Madhubala’s face in the flashes of lightening while they are both taking refuge in some place at the same time (hence the name of the film). He goes on to write a song about this. 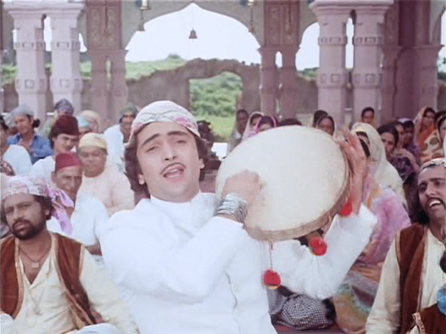 I have been trying to analyse why I a am so totally paagal for filmi qawwali and wonder whether it mighty at least partly because they are the Hindi/Urdu equivalent of bhangra – even this totally unmusical hemiparetic finds his one good foot tapping compulsively to the music. They are so infectious and uplifting. So much so that I now find myself compelled to buy every movie on your list that I don’t already have. There is something very hypnotic about it, sort of like African-American gospel I think, in that it’s participative but also has a very spiritual feeling to it. So you feel easy joining in, and it uplifts you then. Understood. My addiction is such that if I have to buy a dud movie to get a good qawwali for my own compilation DVD, I will. Ha! I buy (and watch) films just for the five minute Helen item number. You are in good company here. Thanks to your post I’ve just ordered reshma aur shera,phool aur patthar, the burning train, sadhna from Induna. Sadly neither they nor nehaflix had Bluffmaster. Perhaps that was lucky, given the cost of shipping stuff up here to Aotearoa. Ooh, good films all (at least, in my opinion, although Phool Aur Patthar’s weepy Meena gets on my nerves). Do let me know what you think of them! These are lovely, thanks! I too feel the Roshan love…although I haven’t been able to bring myself to watch Bahu Begum yet since I need to be in the correct mood to tolerate poor unhappy Meena. “let me point out two gems from “Bahu Begum.” – to paraphrase Renee Zellwegger from Jerry McGuire, “you had me at “two” – thanks for the tip Shalini. Any movie with TWO qawwalis is a must buy for me. One more i would like to add in your list.. The song from Yeh Dil Aashiqana and worth listening. Himanshu, this is fantastic…very spiritual and uplifting :-) Have never heard it before, thanks! Rekha (special appearance) and Amitabh from “Kasme Vaade” (1978). Thanks for the posts everybody!! Glad you like it, and I love qawwalis :) Never get tired of them! 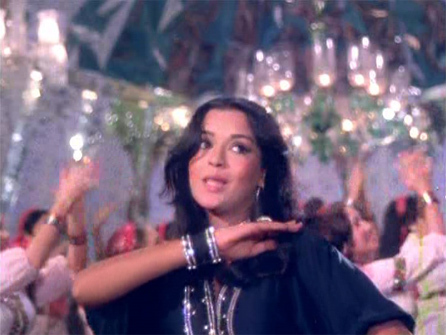 Have you seen this one by the way–Kise kehte hain shikwa from Prem Bandhan (1979)? And it has Helen :-) Almost, I’d say, upstaged by the male dancer! j’ai suivi avec plaisir les commentaires concernant le qawwali. c’est vraiment magnifique. moi meme je suis un fan du qawali.j’aime surtout le qawali de mohamed rafi le plus grand chanteur de l’inde en duo et trio manna dey et asha bhosle.je possede deux cassettes videos pleines de hits qawali tirés des films hindis.je ne me lasse jamais d’entendre les qawali surtout ceux de mohamed rafi. il a une voix divine.le mot qawali signifie en arabe ghoul, c’est a dire parler religieusement d’Allah et de ses prophètes. ..y adults but this is teenage girls! it also stars a 12 year old shyama & shashikala!! no doubt the no 1 qawwali of all times na to karvan ki talaash hai…ishk ishk hai ….12 mts of heaven nothing is close,also 2 more gems in the same film barsat ki raat,,also jhoom barabar from 5 rifles. This is the closest any film qawwali has come to the original mother of all filmi Qawwali’s “Na to Caravan ki Talaash hai” in Barsaat ki raat”. “nigaahien milaane ko ji chahta hai” by Roshan and “Pal do pal ka Saath” by RDB (Though not in the same class as the others) will feature in any top ten filmi Qawallis. kyu khiya khoya chand ki ….. Completely agree – na to karwah ki talash is the mother of all qawwalis. 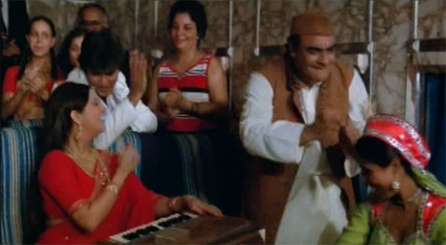 Also the one in “Dharma” where Bindu uses qawwali to tar the reputation of Rekha and Pran chips in to support her. Forgot this. Can anybody tell me the song which is playing in the photo at the top of the page? Wow, Anirban, thanks a tonne for this tidbit. I didn’t even know there was a quawaali recorded for Sholay. I must confess, though, that I’m glad they didn’t use it – because I honestly do not know where they would have used it without slowing the movie down. Memsaab, you must must review these two films on the blog. Looks promising from the songs at least. OMG, Manorama channeling Prithviraj is completely Awesome!!!! I haven’t heard of Raton Ka Raja, although I think I need to look for it (somehow I doubt that I’ll find it with subs though). I have Mr. Romeo, also without subtitles…I think I got lost early on without them and lost interest. Maybe I’ll try it again though! Thank you for the parody Quawwali. Wonderful song..I want to hear more funny Quwwalis. Have been a silent follower of your blog for very long, but just thought I would add two more excellent qawwalis for you. The second one is more popular, with Jeetendra, Vinod Khanna, Rekha. A good list but I think none of these are on the same level as the two from Barsaat Ki Raat – Yeh Ishq Ishq and Na Toh Carwaan Ki Talaash Hai. Another good one is Chehra Chhupa Liya Hai from Nikaah. A recent one is by who else – AR Rahman – Kun Faya Kun from Rockstar. ‘Shirdi wale Sai Baba’ and ‘Hum Kisise Kum Nahin’ are my favorite tracks. Thanks for sharing this great collection of qawwalis. It has some of my favorites. i am surprised no one mentioned raaz ki baat keh doon toh, jaane mehfil mein phir kya ho? pran’s exageratd, “Main chandan ho ba ho hoon” is epic! sorry am a little late to the party! Shirdi wale Sai Baba is my favourite song..
“Haal kya hai dilon ka” is best romantic song ever. Hum Kisise Kum Nahin (Title Track) is evergreen song..
“Teri Mehfil Mein” and “Shirdi Wale Sai Baba” both are my favorite songs.